Holiday Taxis provide professional and affordable airport, port and train transportation in countless locations all over the world to make your holiday stress-free and simple. Some of Holiday Taxis’ most popular transfer locations include Majorca Palma Airport, Ibiza Airport, Barcelona Airport, Costa del Sol Malaga Airport, Faro Airport, Costa Blanca Alicante Airport, Lanzarote Airport and Paris Charles de Gaulle Airport. Not only do Holiday Taxis provide shuttles and taxi transfers abroad, but they also cover UK airports, allowing you to step off a plane into a car that’ll drive you straight home in no time. As well as all this, Holiday Taxis also offer same day bookings, so if you need to arrange last minute travel plans, they can provide quick and reliable transport to and from your destination. And as the winner of the 2018 TravelMole Awards, and a contender for the Globe Travel Awards in 2019, you can rest assured that you’re booking with a transfer company you can rely on. 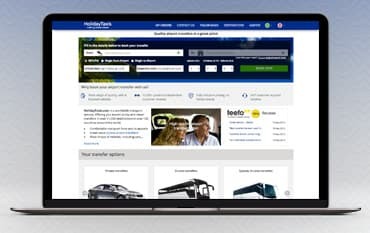 If you can’t find your needed transfer options on the Holiday Taxis’ website then make sure you check out the tailor-made section. There, the helpful Tailor Made team will help you make the most of your holiday with your own personalised transfer service in a location of your choice. From tours, excursions and private coaches, to VIP service and limousine transfers, and everything in between, Holiday Taxis can make your transport to and from airports around the world easy. Whether you want to take a day trip with your very own driver at your disposal, plan your own tour or simply head to the local golf course, you can rely on Holiday Taxis to get you wherever you want to go. Holiday Taxis offer a huge range of airport transfers in the some of the most popular destinations around the UK including Aberdeen, Belfast, Edinburgh, Glasgow, Liverpool, London, Manchester, Newcastle, Southampton and many more. And it’s not just airports either, Holiday Taxis also provide transportation to and from popular bus, train and ferry stations in main locations like Edinburgh Waverley, Tyne, Rosyth, London St Pancras and Southampton. So, whether you're flying into London Heathrow Airport, or taking a trip to Manchester, Edinburgh or Cardiff, with Holiday Taxis you can start enjoying any one of the UK's great cities quicker and easier than ever before. If your outbound flight is delayed or cancelled, please call the supplier on the telephone number shown on the booking voucher. How long must I wait for my shared shuttle transport? Please note that the maximum waiting time for shared shuttle transport is one hour from the time you exit the baggage reclaim hall and locate the supplier representative. How can I contact Holiday Taxis? We are constantly on the hunt for Voucher Codes for Holiday Taxis to help you with your money saving. Our experts check dozens of sites for secret codes including NHS discounts, student sites & social media channels saving you time & money!